pay even passing attention to release dates and we can settle on spring/summer and autumn/winter. predictable perhaps, but thoroughly practical from a cycing apparel point of view. global warming notwithstanding, from about september onwards we can expect cold, wet and windy. then come easter time the expectation changes to slightly less cold, wet and windy. apparel is climate specific, though there is obviously a modest crossover for extremes within each seasonal order. i do so like my long sleeves even in august (on reflection, considering the august past, perhaps long-sleeve jerseys ought to be kept purely for that month). my shorts drawer is liberally filled with bib-threequarters to account for those less than sultry summer afternoons, fulfilling their proper destiny during autumnal and winter months. there are, of course, shorts in there too; what else would one wear under those winter tights? it may be, however, that we have generated an altogether more character building impression upon the world's cycling apparel providers, one that i think may be a striking falsehood. i have long contended that hebrideans are the flandriens of the west, every bit as hard, determined and doggedly idiotic enough to slog through weather conditions best left on the outside of a warm sitting room of coffee house. such idiocy i inadvertantly demonstrated today (it seemed like a good idea at the time) struggling manfully to remain upright in winds gusting to around 75kph. such false impression, for which i claim no responsibility whatsoever, has led several to instigate and foist upon the unwary, pairs of winter shorts. surely this counts as an oxymoron in the same manner as microsoft works, or military intelligence? according to a variety of consulted websites, today's windchill on the hallowed but storm strewn island was a not too healthy minus two degrees, and i think i can say, without fear of contradiction, that there is no way on this earth i would have been out riding in shorts, whether deigned to be of the winter variety or not. i would seriously question whether there is a winter anywhere that allows for even fleece-lined shorts. it has been suggested that shorts of this ilk are more likely for all-year-round wear this far north. however, always keen to live up to that flandrien ideal, it doesn't seem too unwordly or cowardly to augment those shorts with a pair of knee-warmers. and in the cause of keeping all those chain links in a row, pairing a short-sleeve jersey with similarly tailored armwarmers breathed new seasonal purpose into a previously put away for the winter garment. 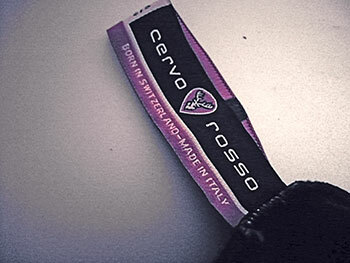 the clothier to which i refer is the rather fine swiss-based cervo rosso. 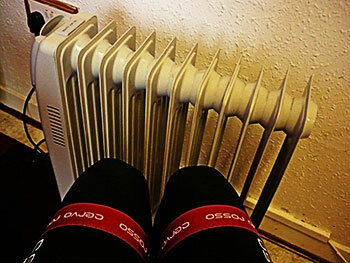 i have recently reviewed cervo rosso's winter shorts, but taking into account my less than hebridean approach to naked legs, proprietor carlyle ware was most kind in sending a pair of thermal leg warmers and armwarmers to keep me cosy and safe. i had expected the leg warmers to be of the change-a-pair-of-shorts-into-bib-threequarters sort of thing, but unless i'm a lot shorter than i though i was, those received made me a pair of tights. peachy keen. elasticated at the top, and hemmed with logo'd red elastic backed with gloop, the single full length seam eases fitting to the point of simplicity. though i received the small size, length was possibly too long for words. in order to have the red hems sited at ankle point, the tops came almost embarrassingly far up one's thighs. 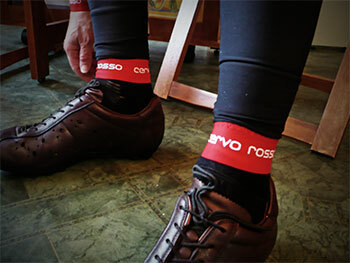 if you're planning on owning a pair of cervo rosso winter shorts, i'd say it was all but mandatory to purchase a pair of the leg warmers simultaneously. it is the hebridean/flandrien way. criticism is not, however, missing in action; the rather inordinate length led to a modest degree of chafing where the leg-warmer overlapped the shorts' seat pad. at least it did on one leg. perhaps it's just me. and while i'm all for manufacturers identifying a product of which they are justifiably proud, attaching a rather huge label to the inner face of both legwarmers and armwarmers is, to my mind, just asking for trouble. if the labels are left in situ, they do provide a point of irritation; not to the extent of distraction, but irritating nonetheless. cut them off, and the tiny stub still affixed to the seam will undoubtedly drive you to distraction. perhaps screenprinting could be considered? 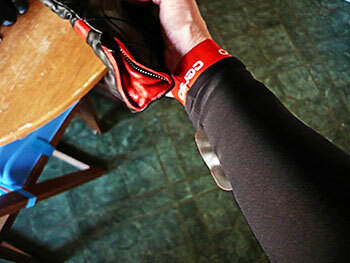 i was very, very unfair to both accoutrements; the weather was cold enough to have made it a major mistake to wear a thin, short-sleeve cervo rosso jersey (albeit, under a waterproof shell), and though the armwarmers performed admirably, the rest of my upper body was not overly warm. the shorts were as brilliant as they initially proved, vying for the title of favourite shorts, but those poor unfortunate leg warmers were repeatedly soaked in hail and sleet over the course of three to four hours. it was necessary to sit almost on top of the heater at debbie's. in their favour, they dried very quickly and did do their utmost to prevent hypothermia of the lower limbs, and i doubt any others could have performed any better. all in all, thermal accoutrements of the highest standard, matching cervo rosso's already stylish apparel in both function and form. lose the big labels and perhaps shorten the length of the legwarmers and the two would be almost too ginger peachy for words. 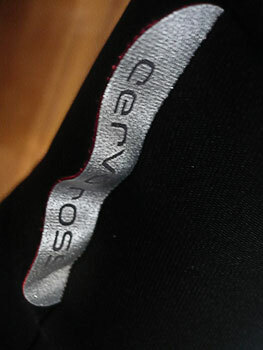 cervo rosso legwarmers retail from the website for £53.10 ($88.50) per pair in sizes small, medium and large. the matching armwarmers cost £35.10 ($58.50) per pair, also in sizes small, medium and large.